The day after Christmas, Scott Terrell, a painter and carpenter from Coeur d’Alene, Idaho turned 58. Never has he felt the weight and wear of his years so acutely. Last August Terrell joined the army of oilfield mercenaries that are rapidly converting great stretches of North Dakota, Montana, South Dakota and Wyoming into the most productive fossil fuel development zone in U.S. history. He quickly landed a job driving a Volvo haul truck on a heavy equipment construction crew that builds the flat-as-a-table, laser-graded oil drilling pads. There is plenty of work. 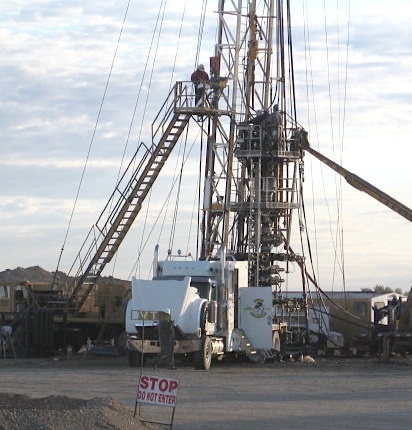 Last year in North Dakota alone, drilling companies punched 2,000 new wells into ground. Terrell (pictured below and who took the shot above) spends 14 hours a day behind the wheel, breathing dust in North Dakota’s hot summers, and pulling up his collar against the fierce wind and cold of the Dakota winter. The pace is relentless and dangerous. The drilling crews on nearby pads are probing portions of the oil-bearing Bakken shale formation saturated with hydrogen sulfide, a lethal gas. North Dakota state health and environmental agencies have documented over 1,000 spills of oil, chemicals, and other compounds, nearly five times as many accidents as in 2004. 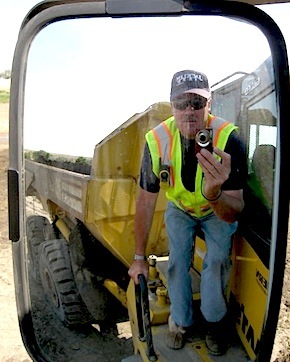 Traffic fatalities doubled from 2010 to 2011 and injuries connected with the movement of heavy oilfield equipment climbed 40 percent in a year in western North Dakota. An explosion and fire on a drilling platform in September killed two young workers and badly burned two others. There is nothing, in short, to hold Terrell to this work other than the wages — $7,000 a month for his three-week-on, one week-off schedule. To some considerable extent, Terrell’s astute summation of his disruptive but necessary career in North Dakota reflects the essential economic contest of our time. In weighing the utility of immediate and generous oilfield income against the longer term risks to his health and emotional equilibrium, Terrell chose the money. Northern Idaho’s reluctant economy doesn’t generate as much demand as it once did for carpenters and painters. While it is new to Terrell and to most of the other 45,000 men who’ve arrived from across the nation to work there now, the Dakota oil field represents something that was once familiar and secure in America. It is a place that provides men with ample opportunities to work for a living wage, the risks be damned. 1. The energy surge in North Dakota is being duplicated in scale and intensity in almost a dozen other states – South Dakota, Montana, Wyoming, Utah, Colorado, Kansas, Texas, Ohio, Pennsylvania, California, and Alaska. New York, meanwhile, is about to lift its moratorium on fracking and relaunch development of the gas-rich Marcellus shale. 2. The national oil and gas surge has generated roughly 600,000 new jobs since 2005, new employment in high-paying work that came while the nation was losing 2.5 million jobs during the same period, according to EMSI, a labor market research group in Moscow, Idaho. 3. The number one American export in 2011 was refined petroleum products. The U.S. exported 1 billion barrels of gasoline, diesel, and aviation fuel worth $88 billion. The last time the country exported more fuel than it imported fuel was 1949, when the U.S. also was the only functioning industrial nation on Earth. 4. Low natural gas prices, generated by a convergence of new technology unlocking vast new supplies, and domestic politics that shielded the developers from government oversight, is prompting big shifts in industrial planning. New steel plants are opening in Ohio, along with new manufacturing plants for water hauling truck trailers, oil drilling equipment, and chemical factories. Utilities are installing new gas-fueled turbines to generate electricity. Pipeline construction is accelerating. Pricewaterhousecoopers produced a report last month that predicted low natural gas prices would generate 1 million new manufacturing jobs over the next decade or so. 5. The U.S. is in the third straight year of increasing oil production, the first time that has happened since the 1970s. Oil imports, which peaked at 455.6 million barrels in August, 2006, fell to 340.8 million barrels in October, 2011, a 25 percent reduction. 6. Shale oil reserves, like those in North Dakota, look to be immense. The estimates of recoverable reserves in the Bakken formation underlying North Dakota have grown to 22 billion barrels, more than 5 times higher than a federal estimate made in 2008. Similarly huge shale oil reserves are under development in Ohio, Texas, Oklahoma, the northern Great Plains, and Colorado. And the horizontal drilling and fracking technology that is unlocking oil from shales miles beneath the surface also is being deployed to tap the country’s existing conventional fields to produce more oil. 6. North Dakota, which had been losing population for decades, is now the fifth fastest growing state, according to a U.S. Census Bureau report in December. European nations led by Germany, Rifkin said, are converting their energy production infrastructure to renewable technologies. China, Circle of Blue noted in its Choke Point: China report last year, is aggressively developing hydro, solar, wind, and nuclear options and taking command of the global alternative energy sector. The U.S., meanwhile, is abandoning the federal commitment to public investments in non-fossil fuel energy sources, and state incentives, led by renewable energy mandates on utilities in 33 states, could be in trouble. Bottom line: the oil and gas boom has produced a reprieve that is likely to last at least a generation. It looks to have taken the urgency of planning for peak oil shortages off the table in the U.S., and globally. Large shale gas and oil reserves are under development in Africa and Asia. High prices have made it practical to develop the deep ocean reserves now being discovered and tapped in Angola, the U.S. Gulf, Alaska, Russia, and Venezuela. But the issue we need to address is can the nation and the world endure another generation of fossil-fueled economic development? Energy industry executives say of course we can. Global climate change is not a threat, they argue, and they’ve successfully convinced their allies in Congress and state legislatures to govern without regard to the warming atmosphere. Much of the rest of the world, though, understands the risks of a warming planet. Still, few nations are responding with genuinely effective domestic programs that promote low carbon alternatives. As we learned in Choke Point: U.S. and Choke Point: China, the aggressiveness with which industrial nations are pursuing carbon-based fuels – coal, oil, gas – and the reluctance to develop low-carbon alternatives is stressing food production, water supplies, and governments all over the world. My sense is that the national and international fossil fuel development surge is like a global helicopter ambulance flying in a jarring storm. While capable of lifting the economy out of harm’s way, the aircraft also is in ever-present danger of crashing.